In the previous blog post (DBT Basics), I was able to explain the very basics of DBT. 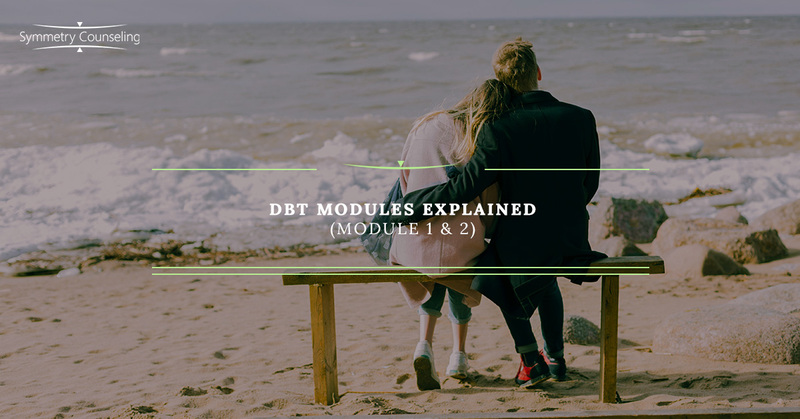 In this post, you will get a better understanding of 2 of the 4 modules (the other two were explained in “DBT Modules Explained (Modules 1 and 2) that are used when working with individuals or groups in a DBT scope. Dialectical Behavioral Therapy, also known as DBT, was founded by Marsha Linehan, who is currently still teaching at the University of Washington-Seattle. There is the Linehan Institution that offers DBT intensive training. When DBT was first identified in the 1990s, it was originally known to help individuals with Borderline Personality Disorder (BPD), but now DBT is useful for all individuals with all disorders. DBT can be really helpful with individuals that suffer from depression, anxiety, eating disorders, substance abuse, and relationship issues. There are four modules: Core Mindfulness Skills, Interpersonal Effectiveness Skills, Distress Tolerance Skills, and Emotion Regulation Skills. Distress Tolerance Skills and Emotion Regulation Skills will be discussed further in this post. Have you ever felt so angry, frustrated, or just unable to handle a situation? Distress Tolerance is a skill that works in addition to mindfulness that was discussed in a previous blog post. When feeling in such an uncontrollable way, you must learn to accept in a non-judgmental way, both in the situation and yourself is necessary for distress tolerance. Accepting reality can be difficult but being able to tolerate and survive the situation and accepting it in the moment. Distress tolerance is not about changing the uncomfortable situation, but to be able to accept it and to tolerate it. Radical Acceptance is also a part of DBT that teaches individuals to let go of the “fighting” that is occurring and acceptance comes from within. Acceptance is a natural human behavior, but that turns into suffering and cannot be tolerated if it is painful. You must learn to accept it with your mind, heart, and body. Every part of yourself must accept what reality is and that everything has a cause (either negative or positive). At times, we have difficulty with accepting what our emotions are or what is going on. To be able to really accept what is going on, we can use willingness which means that we are able to respond in an effective manner and a way that works for us. The opposite is willfulness which implies not accepting challenges and we are just trying to fix the problem or emotion at hand. We think we are helping, but we are really just doing the opposite. Emotion Regulation Skills module teaches individuals how to manage emotions by understanding them, letting go of negative emotions, and learning to reduce emotional suffering. There are primary and secondary emotions in identifying emotions. The primary emotion is the feeling and the secondary emotion is the feeling about the feeling. Emotions help us organize and motivate action, while also allowing us to communicate and influence others, and lastly can be self-validating. In DBT, it is also taught how to reduce emotional vulnerability by taking care of your body and mind while also increasing positive emotions by building a positive environment. In brief, emotion regulation helps teach us how to manage our emotions in a positive manner. ***There are DBT worksheets that help with Distress Tolerance. Please contact Meenal Patel for more information and worksheets.